Over-all students loved visiting SC&UA and were mesmerized by the games they learned about. they would create for their final assignments. 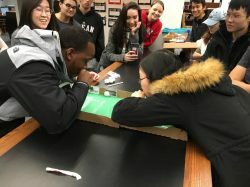 Figure 2 Two students trying to move a paper ball over the opponent’s goal line. Figure 3 Student explaining her toss the ball in the cup game. 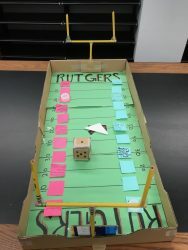 Figure 4 Game created by student using paper, pencils, post-it notes, and tape. materials and a pizza box to create their own game. 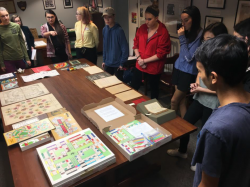 Megan Lotts is the Art Librarian at Rutgers, the State University of New Jersey, where she teaches research workshops, builds collections, facilitates programming and events, and engages with students and faculty researching in the Arts. Lotts has presented her research nationally and internationally and has published articles in portal: the Libraries in Academic, Journal of Library administration, multiple articles in College and Research Libraries News and more. 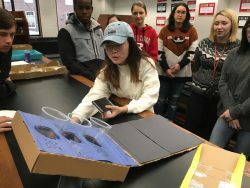 Her research interests include outreach, engagement, and makerspaces, and is known for her work implementing LEGOâ play, at the Rutgers Art Library, as well as her work curating, the Rutgers Art Library Exhibition Spaces. Megan earned her MFA (2004) and MLIS (2007) from University of Wisconsin-Madison and has a BFA in Painting (2000) and BFA in Art History (2002) from the University of Illinois- Champaign-Urbana. She currently lives in New Brunswick, NJ and continues to create site-specific conceptual art-work.